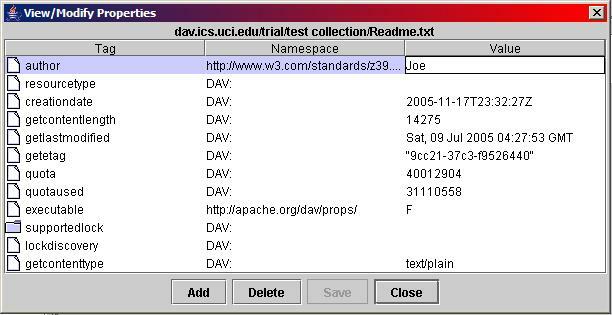 WebDAV allows name/value pairs called properties to be stored on Web resources, providing a place to find information about the Web resource, such as its length, content type, supported locks, etc. This "information about information" is often called metadata. Or click on the view properties icon . A window will appear, like the example below, displaying the properties defined on the resource. As the example shows, properties can be arranged in a hierarchical fashion. To add properties, click on the "Add" button in the Properties window. A dialog like the one shown below, will appear, allowing the addition of a new property. This property can be added to the root of the property hierarchy, or it can be added as a child to the currently selected property. If there is no property selected in the Properties window, the latter option will be disabled. A Property can be modified by double-clicking in the Value field of a property. This is demonstrated in the example below. The changed properties can then be saved with a click on the "Save" button. To delete a property, select it, and then click on the "Delete" button. Note that certain properties, as defined in the WebDAV specification (RFC 2518) can not be changed or deleted.